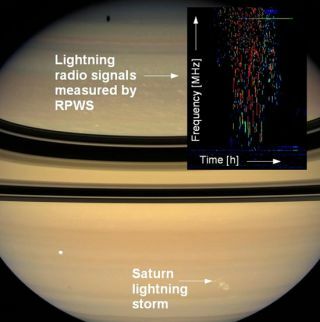 The radio signals generated by the immense lightning storm on Saturn, indicated in the picture. Saturn's moon Tethys sits between the Cassini spacecraft (which took the image) and Saturn. A powerful lightning storm brewing in Saturn's atmospheresince January has become the solar system's longest continuously observedthunderstorm, astronomers have announced. The storm breaks the record duration of 7.5 months set byanother thunderstorm observed on Saturn by NASA?s Cassini spacecraft betweenNovember 2007 and July 2008. The current thunderstorm on Saturn is the ninth that hasbeen measured since Cassini swung into orbit around Saturn in July 2004. Lightning discharges in Saturn?s atmosphere emit verypowerful radio waves, which are measured by the antennas and receivers of theCassini Radio and Plasma Wave Science (RPWS) instrument. The radio waves areabout 10,000 times stronger than their terrestrial counterparts and originatefrom huge thunderstorms in Saturn?s atmosphere with diameters of about 1,900miles (3,000 km). The observations of thislatest thunderstorm will be presented by Georg Fischer of the Austrian Academy of Sciences at the European Planetary Science Congress in Potsdam, Germany, on Sept. 15. "These lightning storms are not only astonishing fortheir power and longevity, the radio waves that they emit are also useful forstudying Saturn?s ionosphere, the charged layer that surrounds the planet a fewthousand kilometers above the cloud tops," Fischer said. "The radiowaves have to cross the ionosphere to get to Cassini and thereby act as anatural tool to probe the structure of the layer and the levels of ionizationin different regions." Results from Cassini's RPWS instrument have confirmedprevious studies of the Voyager spacecraft indicating that levels of ionizationare approximately 100 times higher on the day-side than the night side ofSaturn?s ionosphere. Lightning storms on Saturn usually occur in a region thatnicknamed ?Storm Alley? by scientists. The region lies 35 degrees south ofSaturn?s equator. "The reason why we see lightning in this peculiarlocation is not completely clear," Fischer said. "It could be thatthis latitude is one of the few places in Saturn?s atmosphere that allowlarge-scale vertical convection of water clouds, which is necessary for thunderstormsto develop. However, it may be a seasonal effect. Voyager observedlightning storms near the equator, so now that Saturn has passed its equinox onAug. 11, we may see the storms move back to equatorial latitudes." The lightning's presence was confirmed in another way: DuringCassini?s last close flyby of Titan on Aug. 25, Cassini?s view of Saturn wasobscured by Titan for a half-hour, and no lightning was observed. "Although we know from Cassini images where Saturnlightning comes from, this unique event was another nice proof for their origin,"Fischer said.